Founded in 1977, Love In the Name of Christ is a proven outreach model that helps churches help people in need. It is one of the most effective management, mobilization, and networking tools available to churches today. Using the Love INC model, local churches come together as a network. It’s a cooperative effort that makes a lasting impact on individuals, families, and children in need. Existing resources operating independently are not adequate to meet current and growing levels of need. In addition, one church alone cannot deal with all of the complex issues of poverty. It takes churches working together, across denominational lines, to meet these multifaceted needs. Love INC shows the love of Jesus Christ and brings help and hope to the poor and needy of our communities. Jesus gave us the great commission to love one another. Love INC helps churches turn that love into action. Many people never find an appropriate place to serve within their church.Love INC uses all the skills and talents a congregation has to offer. Time and again, Love INC volunteers tell how this type of service to others enriches and changes their life. Love INC helps generate untapped volunteer resources that already exist in local churches to meet needs both within and outside the church. Love INC screens requests for help as to nature, extent, and legitimacy. 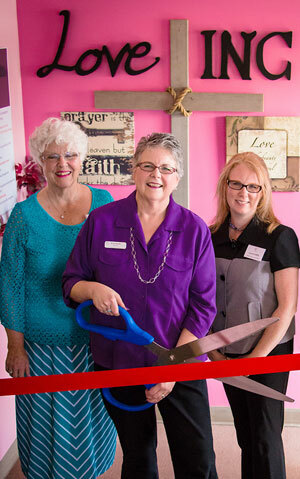 Love INC helps prevent church duplication of existing services already available in the community. Love INC discovers if those requesting assistance are already receiving help from other churches or agencies. The Love INC screening process ensures legitimate needs are met. Through its T.E.A.M. program, Love INC provides long-term, self-help solutions for those who are chronically in need or have multiple needs. Love INC enables churches to assist those outside of their own congregation and be stewards of church resources. Love INC helps prevent churches from building dependency in those they assist by discovering and solving problems at the root level. Love INC helps provide specific, manageable opportunities for churches to reach out with God’s love to people in need. Love INC lessens the burden of any one church by increasing the use of volunteers to meet legitimate needs and rotating assistance among network churches. Love INC is very cost-effective. Founded in 1977, Love INC offers a proven, replicable model that can be easily translated to new communities. Love INC has an established track record in communities of all sizes. Love INC gives Christians specific, manageable opportunities to put their faith and love to work in the service of people in need. Love INC has over 30 years of experience mobilizing churches to meet the needs of its community. Because Scripture tells us love never fails (1 Corinthians 13:8).